Progress on U.S./China trade negotiations and the Federal Reserve’s more dovish rhetoric regarding further interest rate hikes have not convinced us to change our forward outlook that expects the U.S. economy to experience stagnation over the next twelve months. Geopolitical risks remain elevated with Brexit’s outcome uncertain, upcoming elections in the European Union, and the leadup to the U.S. 2020 presidential election campaign likely to impact economic growth and markets. In addition, the combined effects of sanctions on Iran’s and Venezuela’s oil sectors, Saudi Arabia’s need to push oil prices up in order to get its finances in order, and the recent agreement by OPEC and other countries to cut production, means that geopolitics could have an outsized impact on oil prices over the next several months. The Eurozone quarterly economic growth was confirmed at 0.2% in the fourth quarter of 2018, slightly above the previous period’s revised figure of 0.1%.1 Both Germany and Italy have been hit hard, partly due to slowing demand for their exports. While Germany has plenty of fiscal room, Italy, with public debt of more than 130% of GDP, has less ability to address its problems.2 The growth slowdown in China last year was a concern to businesses and market participants and was amplified by the escalation in trade tensions with the United States. Progress on U.S./China trade talks occurred as the March 1st deadline for hiking the tariff on $200 billion of China’s goods was deferred, pending further progress on structural reforms and enforcement measures. Outside of China, U.S. trade issues include USMCA ratification, metals tariffs, and a threatened U.S. duty on European autos. The trade spat with China has resulted in a record increase in the U.S. goods trade deficit. China, which accounts for over half of the deficit, has significantly reduced purchases of U.S. oil after importing a record amount last summer.3 The trade gap is challenging U.S. growth, one of the reasons that U.S. real GDP slowed to 2.6% (annualized) in Q4 from 3.4% in Q3.3 Also challenging was the shockingly small February 20,000 headline job gain. Monetary policy is expected to remain accommodative through 2019. Canada’s GDP expanded at an annualized pace of just 0.4% in the fourth quarter of 2018, well below the 1% expected by consensus.4 Domestic demand was a major drag on Q4 growth as consumption stalled (the worst performance since 2012), while government spending, business investment, and residential investment all subtracted from growth. Following the significant drawdowns and large price swings in risk assets in late 2018, realized market volatility has dropped sharply across equity markets in 2019. U.S. equities managed to continue their winning streak in February. The S&P 500 gained 3.2% for the month, and smaller caps did even better, with the S&P MidCap 400 and S&P SmallCap 600 up 4.2% and 4.4%, respectively. Apart from U.S. Treasuries, bonds gained. Canadian equities were up in February, with the S&P/TSX Composite up 3.2%. Benefitting from global risk-on sentiment, European equities jumped in February, as the S&P Europe 350 gained 4.1% on the month. With less than four weeks to go until Brexit, U.K. equities rallied, sending the S&P United Kingdom up 2.4% on the month. In a major concession, U.K. Prime Minister Theresa May promised Parliament an opportunity to vote to extend Article 50 by up to three months and to prevent a no-deal Brexit, if it rejected her updated withdrawal agreement. German equities gained in February, despite the country narrowly avoiding a recession. Italian equities were also up on the month, even after Italy officially entered into recession. February was a positive month for Asian equities, with the exception of Korea and India. Commodities continued to post gains in February, driven by the boost in oil prices as a result of supply cuts from OPEC. In March, we held our asset allocation constant at the February allocations. Allocation to Equities remains at 30% in Tactical Conservative, 40% in Tactical Moderate Growth, 50% in Tactical Growth, and 60% in Tactical Aggressive Growth, continuing the exposure to U.S. equities, with the balance in all models allocated to U.S. municipal bonds and mid-term U.S. treasuries. This asset allocation continues to reflect our concerns that the U.S. economy is slowing but is more stable than other global equity markets, and the relative attractiveness of interest rates in the U.S. versus the rest of the world. We will continue to monitor the data for growth, inflation, and recession signals from employment, consumer spending, business sentiment, Fed policy, the yield curve, inflation, and global economics. Our focus is on protecting portfolios from downside risk, and we believe that our investment process is working to achieve that goal. 1Trading Economics, Europe GDP. March 2019. 2Trading Economics, Italy Government Debt to GDP. December 2018. 3BMO Capital Markets. North American Outlook. March 4, 2019. 4Trading Economics, Canada GDP. January 2019. Index return data from Bloomberg and S&P Dow Jones Indices Index Dashboard: U.S., Canada, Europe, Asia, Fixed Income. February 28, 2019. Index performance is based on total returns and expressed in the local currency of the index. Geopolitical risks are expected to dominate global asset class performance over the coming months. Consideration of ongoing trade tensions and the aftermath of the U.S. government shutdown have led us to revise our forward outlook to reflect our view that the U.S. economy will experience stagnation over the next twelve months. In February, we held our asset allocation constant at the January allocations. Allocation to Equities remains at 30% in Tactical Conservative, 40% in Tactical Moderate Growth, 50% in Tactical Growth and 60% in Tactical Aggressive Growth, continuing the exposure to U.S. equities, with the balance in all models allocated to U.S. municipal bonds and mid-term U.S. treasuries. This asset allocation continues to reflect our concerns that the U.S. economy is slowing but is more stable than other global equity markets and the relative attractiveness of interest rates in the U.S. versus the rest of the world. 1International Monetary Fund, World Economic Outlook. January 2019. 2Trading Economics, U.S. Retail Sales. January 2019. 3JP Morgan, Global Data Watch. February 15, 2019. 4International Monetary Fund, World Economic Update. January 2019. 5World Gold Council. Gold Demand Trends Full year and Q4 2018. January 31, 2019. Index return data from Bloomberg and S&P Dow Jones Indices Index Dashboard: U.S., Canada, Europe, Asia, Fixed Income. January 31, 2019. Index performance is based on total returns and expressed in the local currency of the index. As we enter 2019, there is a heightened focus on downside risks both domestically and globally in the markets and in the broader economy. A negative feedback loop has emerged that is centered in the U.S., linking bad policy choices to falling asset prices, tighter financial conditions, and weaker corporate earnings. In the short-term, the current U.S. government shutdown is having more than an impact of inconvenience on the U.S. economy. In January, we revised our twelve-month forward outlook to reflect the delayed impact of inflation on the U.S. economy. We believe that U.S. economic growth is moving toward stagnation and will be followed by an inflationary environment that will likely precede a recession in 2020. The current outlook now factors in six months of stagnation followed by six months of inflation over the twelve-month forecast period. The IMF said in an update to its World Economic Outlook in October that it is now predicting 3.7% global growth in both 2018 and 2019, down from its July forecast of 3.9% growth for both years.¹ Across emerging market and developing economies, prospects are mixed. The downgrade reflects the introduction of import tariffs between the United States and China, weaker performances by Eurozone countries, and rising interest rates that are pressuring some emerging markets with capital outflows into the stronger U.S. dollar, notably Argentina, Brazil, Turkey, South Africa, Indonesia, and Mexico. In conjunction with the global growth downgrade, the IMF downgraded the 2019 U.S. growth forecast to 2.5% from 2.7% and cut China’s 2019 growth forecast to 6.2% from 6.4%.¹ Our focus over the next six months is on the impact of tighter Fed policy that is likely to hit business investment and, in combination with the stronger dollar, weigh on industrial output too, causing GDP growth to slow sharply. The Canadian economy is set to weather the current slump in global oil prices better than it did in 2015, but it will not escape unscathed. The 9,300 job increase in employment in December was better than expected and the unemployment rate held at a 40-year low of 5.6%.² The housing market is showing signs of weakness and higher interest rates are starting to weigh on consumer spending. With this considered, we expect the Bank of Canada to cut rates in 2019. U.S. equities experienced a very disappointing year in 2018. The S&P 500 was down 4.4%, its first negative year since 2008, still better than the S&P MidCap 400 and S&P SmallCap 600 down 11.1% and 8.5%, respectively. In the month of December, the S&P 500 declined 9.0%, while Mid-Caps were down 11.3% and Small-Caps lost 12.1%. Canadian equities were negative, with the S&P/TSX Composite down 5.4% for the month and 8.9% for the year. The S&P Europe 350 fell 5.5% in December and 9.9% for the year, mostly due to Brexit tensions, global trade uncertainty, and sharp declines in commodity prices. Internationally, most markets underperformed the U.S., with the S&P Developed Ex-U.S. BMI and S&P Emerging BMI both down about 14% for the year. The S&P China 500 completed 2018 with a loss of 19%. In January, we shifted our fixed income exposure out of 3-7 year Treasuries and into 7-10 year Treasuries in all models. In addition, in the Tactical Growth and Tactical Aggressive Growth models, an additional 10% was taken out of the S&P 500 and added to 7-10 year Treasuries. Allocation to Equities remains at 30% in the Tactical Conservative model and 40% in the Tactical Moderate Growth model, and decreased to 50% in the Tactical Growth model, and 60% in the Tactical Aggressive Growth model. We continued exposure to U.S. equities, with the balance in all models allocated to U.S. municipal bonds and mid-term U.S. treasuries. This asset allocation is reflective of the current concern that the U.S. economy is slowing while the relative attractiveness of interest rates in the U.S. versus the rest of the world prevails. While the poor market depth and soft liquidity that marked December 2018 are beginning to fade, weak sentiment is likely to remain a prominent feature in the coming months. We will continue to monitor the data for growth, inflation, and recession signals from employment, consumer spending, business sentiment, Fed policy, the yield curve, inflation, and global economics. Our focus is on protecting portfolios from downside risk, and we believe that our investment process is working to achieve that goal. ¹ International Monetary Fund, World Economic Outlook. October 2018. ² Trading Economics, Canadian Employment. December 2018. Index return data from Bloomberg and S&P Dow Jones Indices Index Dashboard: U.S., Canada, Europe, Asia, Fixed Income. December 31st, 2018. Index performance is based on total returns and expressed in the local currency of the index. As we enter 2019, there is a heightened focus on downside risks both domestically and globally in the markets and in the broader economy. A negative feedback loop has emerged that is centered in the U.S., linking bad policy choices to falling asset prices, tighter financial conditions, and weaker corporate earnings. Since the October IMF Report, tighter monetary conditions and the intensification of trade tensions have had a further impact on business and financial market sentiment, triggering financial market volatility and slowing investment and trade. The U.S. move to more restrictive monetary policy includes both increasing the fed funds rate and removing liquidity across markets as Quantitative Easing is unwound by not rolling over treasury bonds on the federal balance sheet as they mature. This has led to greater tightening than the rising of the fed funds rate alone would cause. The combination has led to market volatility rising from the greater sensitivity to the price impact of minor macroeconomic events. SOURCE: BANK FOR INTERNATIONAL SETTLEMENTS, FACTSET, J.P. MORGAN ASSET MANAGEMENT. DATA AS OF NOVEMBER 8, 2018. Emerging markets have been impacted particularly hard by U.S fiscal stimulus and monetary policy tightening. 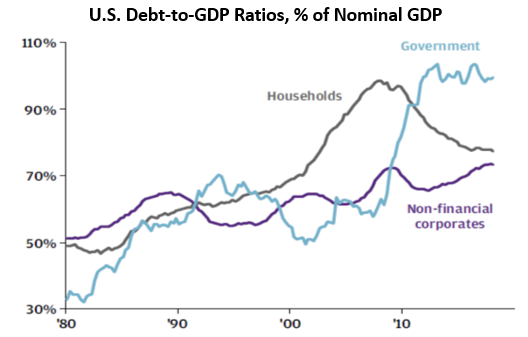 As a result, emerging economies have experienced capital flight and rising dollar-denominated debt. The ongoing threat of higher trade barriers that would disrupt global supply chains and slow the spread of new technologies, ultimately lowering global productivity, would feed into higher volatility. These restrictions would also make consumer goods less affordable, harming low-income households disproportionately. Those relying heavily on exports have suffered the effects of lower commodity prices, and those trading indirectly with China have also felt the effects of the trade war. The deflationary effects of global recession are expected to erode inflation and increase global demand for high quality cash and fixed income, which would most certainly find its way to the United States. SOURCE: VANGUARD RESEARCH. DECEMBER 2018. VANGUARD CALCULATIONS BASED ON FEDERAL RESERVE’S FRB/US MODEL. The threat of a global recession is real, as the U.S. is the largest global economy and the US Dollar remains the world’s reserve currency. While trade wars would create long-term negative impacts to the global economy, the U.S. “America First” policy has pushed up short-and long-term interest rates and strengthened the dollar relative to other currencies. The problem is not that trade practices in the rest of the world are creating the U.S. trade deficit, rather that the economic policies of the United States are the source of the problem. US Dollar strength will continue to make the trade imbalance wider, giving protectionists more ammunition to raise the ante in a spiraling situation. Our concern is that current policies are expected to have stagflationary effects (reduced growth alongside higher inflation). A limit in foreign direct investment and broad restrictions on immigration, which reduce labor-supply growth at a time when workforce aging and skills mismatch, would continue to contribute to the problem. To break the loop, three policy reversals must happen. The first is to reign in massive U.S. deficit spending that is occurring during a period of economic expansion. The second is that monetary policy, including rising interest rates and a shrinking fed balance sheet, needs to be slowed or reversed. And third, a truce on U.S.-China trade must hold beyond March. Until we see these policy reversals, our Outlook for the next twelve-month period is for six months of Stagnation followed by six months of Recession. The Canadian economy is set to weather the current slump in global oil prices better than it did in 2015, but we expect it will not escape unscathed. The 9,300 job increase in employment in December was better than expected, and the unemployment rate held at a 40-year low of 5.6%. iv The housing market is showing signs of weakness, and there are signs that higher interest rates are starting to weigh on consumer spending. v In the absence of further rate hikes, we expect GDP growth to slow from 2.0% in 2018 to 1.5% in 2019. The Bank will likely cut rates in 2019. Frame Global Asset Management adheres to an investment process that focuses first and foremost on identifying and minimizing downside risk. We do this by recognizing the past relationships between asset class behavior in economic environments and analyzing the current environment and relationship with asset classes. Recessions are typically triggered by policy mistakes, and the Federal Reserve may very well be on the road to making one as fears that the central bank will raise interest rates by too much and too quickly weighed heavily on stocks in 2018. The Fed increased its target rate four times in 2018, with the final hike of the year coming in December, sending the equity markets into a tailspin. vi The Federal Open Market Committee (FOMC) implements monetary policy to help maintain an inflation rate of 2% over the medium term. The FOMC judges that inflation at the rate of 2% (as measured by the annual change in the price index for personal consumption expenditures, or PCE) is most consistent over the long run with the Federal Reserve’s mandate for price stability and maximum employment. While this ongoing move to tighten monetary conditions was underway throughout 2018, fiscal policy via massive tax reform changes was intended to provide stimulus to the already robust U.S. economy. 2018 kicked off with the enactment of tax cuts that pushed up long-term interest rates and created a sugar high in an economy that was close to full employment. The flow of repatriated corporate cash is just one example of the flood of payouts to shareholders, both as buybacks and dividends. Such payouts are expected to rise by 28% this year to almost $1.3 trillion. The surge in buybacks has added controversy over the tax cut package that President Trump championed. Republicans said the deal would be “rocket fuel” for the American economy. Democrats argued the share buybacks show that the tax cuts were a giveaway to the wealthy and won’t stimulate corporate investments and job creation. It’s highly unusual for deficits and borrowing needs to grow this much during periods of prosperity. Despite a strong economy, the fiscal health of the United States is deteriorating fast, as revenues have declined. Escalating trade tensions and the potential shift away from a multilateral, rules-based trading system are key threats to the global outlook. An intensification of trade tensions and the associated rise in policy uncertainty has already triggered financial market volatility and slowed investment and trade. The latest U.S. actions against China seem to fuel a broader trade, economic, and geopolitical cold war. Since the IMF’s April 2018 World Economic Outlook, protectionist rhetoric has increasingly turned into action, with the United States imposing tariffs on a variety of imports. The two countries’ trade teams have been given until March 1st to agree on structural changes in China with respect to “forced technology transfer, intellectual property protection, non-tariff barriers, cyber intrusions and cyber theft, services, and agriculture”. American authorities have long accused China’s government of forcing foreign companies to give their proprietary technology to Chinese partners, but such demands are not enshrined in Chinese legislation and not recorded. Permanently higher trade barriers would disrupt global supply chains and slow the spread of new technologies, ultimately lowering global productivity and welfare. Restrictions would also make tradable consumer goods less affordable, harming low-income households disproportionately. However, tightening monetary policy, worsening economic disputes, and slower demand from China are three key drivers that will dominate a weaker growth outlook in 2019. Elsewhere, the risk of the UK withdrawing from the EU without a trade agreement in place has risen, while domestic political risks will likely continue to weigh on the credit outlooks for Italy, Brazil, Turkey, and Argentina. Global credit conditions are expected to weaken in 2019 as economic growth decelerates, funding costs increase, liquidity tightens, and market volatility returns. Trade, political and geopolitical risks will likely escalate as tensions between the U.S. and China heighten. In addition, consequences of slower growth will increasingly thrust globalization and inequality debates into the political arena. Volatility has made a comeback in recent months as a litany of concerns from U.S. policy to China-U.S. trade to tightening financial conditions to slowing earnings growth have overwhelmed investors, leading to broad-based, short-term panic selling. Both monthly index volatility and average constituent correlations for the S&P 500 reached a five-year high, due to higher trading volumes in U.S. equities coupled with December’s decline in liquidity. xv Dispersion among U.S. equities declined during December, with earnings reports largely completed and broader themes dominating sentiment. In 2018, the S&P 500 exhibited higher volatility, higher correlations, and higher dispersion compared with 2017, with monthly correlations and volatility averaging more than double last year’s levels. In December, the one-month volatility of the S&P 500 spiked to its highest level since 2012, surpassing previous highs in February 2018 and August 2015. xvi More than 40% of trading days in December saw the S&P 500 fall over 1%, triple the historical average. xvii The loss of 2.7% on December 24 for the S&P 500 was the largest percentage decline on the trading day before Christmas ever. This was followed by a 5% gain on December 26, which represented the largest percentage gain since March 23, 2009. xviii It is worth noting that volatility is still nowhere near the levels seen during the heights of the financial crisis. In December, we revised our twelve-month forward outlook to reflect the current counterbalancing influences of inflation on the U.S. economy. We believe that the U.S. is moving toward an inflationary environment that will occur just as growth is slowing. The December Outlook factored in six months of growth followed by six months of inflation over the twelve-month forecast period. Recent reasons to hope for a more stable global economy in 2019 are contending with reasons to worry. Hope has come from the temporary US-China tariff truce and an oil supply shock that will positively impact global consumer spending next quarter. 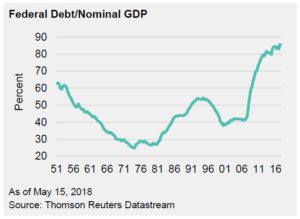 Concern remains as global geopolitical risks escalate, and the fading benefit of fiscal stimulus combined with tighter monetary policy in the U.S. causes a slowdown in rate-sensitive sectors that will likely spread to the broader economy and beyond the U.S. borders if not addressed. Global business surveys indicate declines in activity in China and softness in most European countries. In December, we continued to maintain our current asset allocation across all models. This asset allocation is reflective of the current relative attractiveness of interest rates in the U.S. versus the rest of the world. iInternational Monetary Fund, World Economic Outlook. October 2018.
iiInternational Monetary Fund, World Economic Outlook. October 2018.
iiiInternational Monetary Fund, World Economic Outlook. October 2018.
ivTrading Economics, Canadian Employment. December 2018.
vTrading Economics, Canadian Housing Market. December 2018.
viFederal Open Market Committee Transcripts. 2018.
viiFederal Open Market Committee Transcripts. 2018.
viiiCBO. Monthly Budget Review: Summary for Fiscal Year 2018.
ixCBO. Monthly Budget Review: Summary for Fiscal Year 2018.
xTankersley, Jim & Phillips, Matt. 2018. Trump’s Tax Cut Was Supposed to Change Corporate Behavior. Here’s What Happened. New York Times. November 12.
xiInternational Monetary Fund, World Economic Outlook. October 2018.
xiiADP National Employment Report. January 3, 2019.
xiiiBMO Capital Markets Economics Focus. January 4, 2019.
xivS&P Dow Jones Indices. Index Dashboard: Asia. December 31, 2018.
xvS&P Dow Jones Dashboard, Dispersion, Volatility, and Correlation. December 31, 2018.
xviBMO Capital Markets. US Strategy Snapshot. January 2, 2019.
xviiBMO Capital Markets. US Strategy Snapshot. January 2, 2019.
xviiiBMO Capital Markets. US Strategy Snapshot. January 2, 2019. Recent reasons to hope for a more stable global economy in 2019 are contending with reasons to worry. Hope has come from the temporary U.S./China tariff truce and an oil supply shock that will positively impact global consumer spending next quarter. 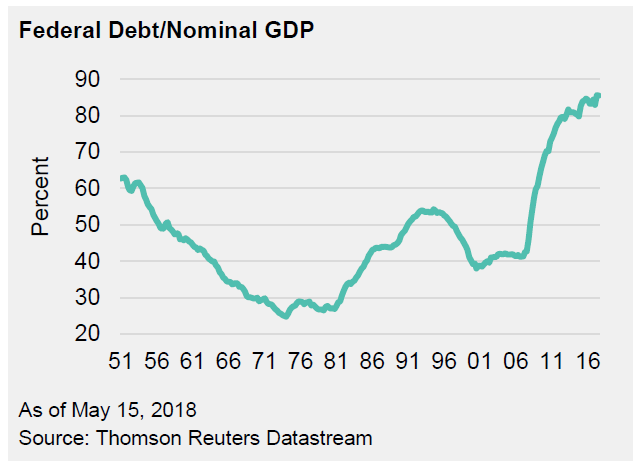 Concern remains as global geopolitical risks escalate, and the fading benefit of fiscal stimulus combined with tighter monetary policy in the U.S. is causing a slowdown in rate-sensitive sectors that will spread to the broader economy and beyond the U.S. borders if not addressed. Global business surveys indicate declines in activity in China and softness in most European countries. In December we revised our twelve-month forward outlook to reflect the delayed impact of inflation on the U.S. economy. We continue to believe that U.S. economic growth is moving toward an inflationary environment that will likely precede a recession in late 2019 or in 2020. The current outlook now factors in six months of growth followed by six months of inflation over the twelve-month forecast period. After October’s sharp declines, U.S. equities returned to positive territory in November. The S&P 500 was up 2.0%, while the S&P Midcap 400 gained 3.1% and S&P Smallcap 600 gained 1.5%. Canadian equities returned to positive territory in November, with the S&P/TSX Composite up 1.4%. Global trade uncertainty and declines in commodity prices factored into the S&P Europe 350 declining 0.8% in November. The S&P United Kingdom dropped 1.4% as markets waited on the outcome of Brexit negotiations. Emerging markets rebounded from October’s losses, with the S&P Emerging BMI up 4.7%. The S&P Pan Asia BMI gained 3.3%, with the negative exception being Australia. S&P China 500 gained 3.7%. In December, we continued to maintain our current asset allocation across all models. Allocation to Equities will remain at 30% in Tactical Conservative, 40% in Tactical Moderate Growth, 60% in Tactical Growth, and 70% in Tactical Aggressive Growth, providing exposure to U.S. equities, with the balance in all models allocated to U.S. municipal bonds and medium-term U.S. treasuries. This asset allocation is reflective of the current relative attractiveness of interest rates in the U.S. versus the rest of the world. 1 Capital Economics, Global Economics Update. December 14th, 2018. 2 JP Morgan, Cross Asset Strategy. December 14, 2018. 3 CNN Business, “The trade war is pushing business out of China, but not into America.” November 16th, 2018. 4 Trading Economics. U.S. November Non-Farm Payrolls. 5 Trading Economics. U.S. CPI, November 2018. Index return data from Bloomberg and S&P Dow Jones Indices Index Dashboard: U.S., Canada, Europe, Asia, Fixed Income. November 30th, 2018. Index performance is based on total returns and expressed in the local currency of the index. The global economy has delivered above-trend growth and a modest rise in inflation this year. This trend is expected to end, as increasing dependence on U.S. demand should not be capable of carrying the rest of the world. We expect that the combination of the escalating trade dispute with China and monetary tightening by the Federal Reserve will start to weigh on U.S. growth in 2019. In November, we evolved our twelve-month forward-looking outlook to reflect our view that we are moving closer to a U.S. inflationary environment that will likely precede a recession in the U.S. in late 2019 or 2020. The current outlook now factors in three months of growth followed by nine months of inflation over the twelve-month forecast period. Third quarter GDP reports point to Developed Market divergences, as U.S. GDP grew at a 3.5% annualized rate with a greater than 9% gain in import volumes.1 Meanwhile, Germany and Japan’s GDP rates both contracted.2 Due to the size of these latter two economies – the third and fourth largest in the world respectively – they play an important role in driving global growth. In addition, the political and economic weakness of Italy, the Eurozone’s third-largest economy, is a concern. Data announced towards the end of the month showed that Italy’s GDP growth rate had fallen to zero in the third quarter, adding further pressure to the political impasse over the budget.2 The 2.4% budget deficit proposed by the new Italian government creates the risk that Italian government debt may be downgraded to sub-investment grade. The trade war is showing early signs of affecting the U.S. economy, which has so far had a strong 2018. In October, a net number of 250,000 jobs were created and wage growth continued to accelerate to 3.1%, the fastest annual gain since 2009.3 In contrast, the trade tariffs that the U.S. imposed on Chinese imports and Chinese retaliation to the U.S. have impacted the U.S. manufacturing and agricultural sectors, and rising interest rates are beginning to cause private consumption to slow. In Canada, the NAFTA (renamed the USMCA) resolution paves the way to potential additional Bank of Canada rate hikes. In U.S. equity markets, low stock correlations typically favour stock pickers, but do not address the opportunities to take advantage of the magnitude of dispersion. It is notable that in October, the odds of picking a large underperformer were greater than those of selecting a large outperformer. Volatility, correlation, and dispersion all rose in the S&P Global 1200 Index in October. U.S. equities ended the month with a loss of 6.8% for the S&P 500, loss of 9.6% for the S&P MidCap 400, and a loss of 10.5% for the S&P SmallCap 600. The S&P/TSX Composite lost 6.3%, bringing it into the red for 2018 year-to-date. Latin America was the sole region to post a positive return, with the S&P Latin America BMI up 4.9%, driven exclusively by Brazil, as the S&P Brazil BMI gained 18.4%, while Mexico’s fell by 11.2%. The S&P Europe 350 posted its worst month since January 2016, falling 5.3% in October. The S&P United Kingdom fell similarly in local terms. Trade tensions and concerns regarding the outlook for global growth in China rattle nerves through the Asian markets, with the S&P Pan Asia BMI down 9.8%. Japanese equities erased their gains in September, with the S&P/TOPIX 150 down 9%. Though there were few safe havens left, the S&P GSCI Gold Index gained 2% in October. In November, we decided to maintain our current asset allocation across all models. Allocation to Equities will remain at 30% in Tactical Conservative, 40% in Tactical Moderate Growth, 60% in Tactical Growth, and 70% in Tactical Aggressive Growth, providing exposure to U.S. equities, with the balance in all models allocated to U.S. municipal bonds and mid-term U.S. treasuries. This asset allocation is reflective of the current relative attractiveness of interest rates in the U.S. versus the rest of the world. 1 Bureau of Economic Analysis. National Economic Accounts. Gross Domestic Product, Third Quarter 2018 (Second Estimate). 2 Trading Economics. Third Quarter 2018 Germany, Japan, Italy GDP Estimates. 3 Bureau of Labour Statistics. Current Employment Statistics Highlights. November 2, 2018. Index return data from Bloomberg and S&P Dow Jones Indices Index Dashboard: U.S., Canada, Europe, Asia, Fixed Income. October 31, 2018 and November 21, 2018. Index performance is based on total returns and expressed in the local currency of the index. Returns for European regional indices are expressed in Euros. A year ago, global economies were enjoying synchronized growth. Growth increased in every large economy during 2017, except Britain, and even in most emerging economies. Global trade was surging with the U.S. booming and China’s deflation under control. While President Trump’s tax cuts helped lift annualized quarterly growth above 4% and unemployment is its lowest since 1969, the IMF is predicting growth will slow in 2018 in every other large advanced economy and in emerging markets that are under stress1 . Emerging markets account for 59% of the world’s output (measured by purchasing power), up from 43% two decades ago, when the Asian financial crisis hit2 . Global trade disruptions impact global growth along with capital balances and flows globally. Along with the deviation in GDP between the U.S. and the rest of the world is monetary policies. While the Federal Reserve has raised interest rates eight times since December 2015, the European Central Bank (ECB) is still a long way from its first increase. In Japan rates are negative. China has relaxed monetary policy in response to a weakening economy. When interest rates rise only in the United States, the dollar strengthens, making it harder for emerging markets to repay their dollar debts. The rising dollar has already propelled Argentina and Turkey into trouble and Pakistan has asked the IMF for a bail-out. We see many additional divergences including between productivity and real wages, in the inequality between and within countries and across skill and income segments of labour markets around the globe. In the first three industrial revolutions, capital was applied to innovation, complementing labour to permanently shift how the economy worked. As global economies experience shifts in employment, diverging productivity and real wages, intergenerational inequality and politically charged tensions are growing between automation and those whose livelihoods it threatens. The current regime shift is unlike the previous three industrial revolutions in that technological capital is being applied as a substitute for labour rather than as a complement to labour. We look at the way that the economy is evolving in order to better understand where it is heading. A cover story published in The Economist on April 30th, 2016, “The Prosperity Puzzle,” documented several reasons why official measurements of U.S. inflation, GDP, and productivity growth fail to measure economic activity in the modern economy and have become misleading. We discussed this shift in the relationship among economic measures in our Q2 2016 Quarterly Summary and Outlook, available on our website. The article discussed that the link between productivity growth and modern living standards has changed. At the root of this issue is that productivity growth measures the increase in output per worker hour in a world where the meaning of “output” has become less obvious, as some of this “output” is not relatable to conventional living standard measurements. The greater use of capital directed toward technology and artificial intelligence in areas previously dominated by labour is at the center of this shift. Globalization, liberalization of labour markets, migration and inflation targeting are affecting growth and inflation, investment, wages, productivity and employment. We recognize that while the global economy is integrated due to trade and the flow of capital and currency, actions taken within one economy can isolate it from the rest of the world. This is a feature of our adaptive tactical investment process. In the U.S, the dominant narrative for Donald Trump’s ascent to the White House has been that his “America first” message appeals directly to those who feel that they are being “left behind.” Actions taken regarding trade and fiscal policy have important implications for economic growth and interest rates both within the United States and abroad. To reiterate our investment approach, we consider the outlook for the global economy relative to a view of expected U.S. GDP growth in the twelve months ahead. 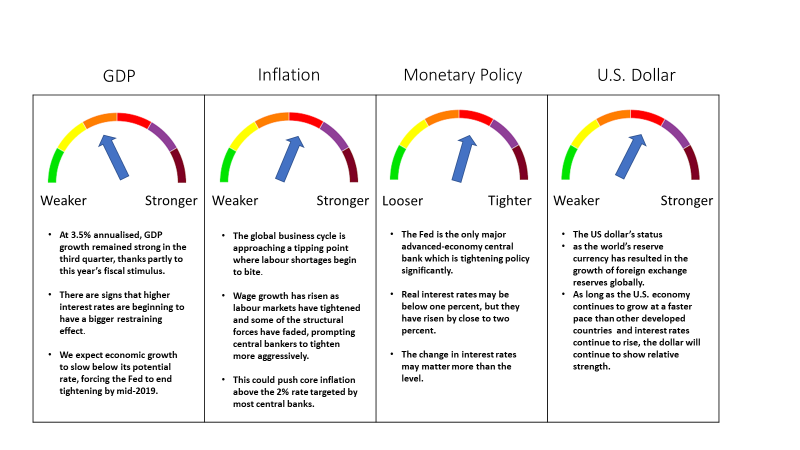 The outlook falls into one of our five broad descriptions: GROWTH, STAGNATION, RECESSION, INFLATION and CHAOS, allowing for a transitioning in the period from one environment to another as well as recognizing total regime shifts (see White Paper 2 available on our website). Entering the fourth quarter of 2018, our outlook has evolved to a six-month period of U.S. Growth followed by six months of inflation. The dominance of the US dollar, being the primary reserve currency and the currency that commodities are priced in, makes the existence of a U.S. trade deficit almost inevitable. The constant demand for US dollars outside of the United States reinforces the currency’s value and the stronger it is relative to other currencies, the more it makes U.S. imports of overseas goods cheaper in US dollar terms and the less competitive it makes U.S. exports. Two years ago in our Q1 2016 Report, available on our website, we were addressing a very different situation as the US dollar had declined against other major currencies since its peak at the beginning of the year. Three key developments had explained the slide; higher commodity prices, increased appetite for safe havens and a scaling back of expectations for tighter Fed policy. Emerging market currencies had seen improvement as commodity prices had recovered. The Chinese renminbi had strengthened against the US dollar, having been one of the best performing currencies. This had an adverse impact on China’s manufacturing sector and particularly exporters. Now the situation is the opposite, as the US dollar has strengthened for the reasons cited. When the U.S. economy is at full employment, trade sanctions against imports add fuel to domestic inflation, prompting the fed to raise rates further, causing the dollar to strengthen further, resulting in cheaper imports and more costly exports. In this environment, further Fed rate hikes have less impact on wage inflation due to full employment and only worsen the incentive to buy cheaper imported goods. At this stage in the economic cycle, a U.S. recession could quickly impact the global economy. Our concern is that the developed world is not prepared to deal with even a mild recession. The policy arsenal remains depleted from fighting the last downturn. In the past half-century, the Fed has typically cut interest rates by five or so percentage points in a downturn. Today it has less than half that room before it reaches zero while the euro zone and Japan have no room at all. Canada Weathers Trade Attacks from the U.S. In Canada, the economy continues to show strength while well-contained inflation numbers support that the Canadian economy remains on the growth path. Exports were the main driver of the boost in annualized GDP growth from 1.4% in Q1 to 2.9% in Q23 . Household spending growth rebounded, although remaining lower than in 2017. Annual non-energy export growth hit a 2-year high of 4.3% in August, confirming that exporters are benefitting from stronger global demand and accelerated U.S. growth4 . Exporters should receive a further boost following the successful conclusion of trade talks with the U.S., which would also encourage more business investment. This was reflected in the Bank of Canada’s third-quarter Business Outlook Survey which revealed a strong rebound in firms’ investment intentions. Going forward we continue to monitor the direction of commodity prices, the demand for safe havens and the federal funds rate as well as employment, consumer spending, business sentiment, the yield curve, inflation, and global economics. Our focus is on protecting portfolios from downside risk, and we believe that our investment process is working to achieve that goal. U.S. Real GDP increased at an annual rate of 4.2% in Q2 2018, according to the “third” estimate released by the Bureau of Economic Analysis. In Q1, real GDP increased 2.2%. For the third quarter, the 0.5% month-over-month rise in underlying retail sales in September suggests that real consumption growth was 3.5% annualized but net trade, driven by Trump’s trade wars appears to have been a drag on GDP growth5 . Current consensus for GDP growth in the third quarter is 3%, a solid number despite the decline from the second quarter. Real 2-year Treasury yields have now risen by over 200 bp since reversing, matching the increases ahead of each of the past three recessions. There are signs that rising borrowing costs are weighing on rate-sensitive sectors of the economy, with the drop back in housing starts in September confirming that residential investment was once again a drag on the economy in the third quarter. Not only are homebuilders struggling with severe labour shortages, but the surge in mortgage interest rates this year is clearly taking its toll on demand. Consumption has been amplified by tax cuts but rising interest rates are starting to constrain auto purchases as well as housing market activity. At the same time, the economy is closing in on full employment and barriers to expansion including labor shortages are evident in several industries. The boost from fiscal stimulus resulting from the tax cuts is close to fully absorbed and as economic growth begins to slow due to a textbook monetary policy tightening cycle, the Fed will be prompted to stop raising interest rates. We anticipate this to happen midway through 2019 with the risk that the tightening that will have occurred up to that point may have already put the economy into a recession. The U.S. budget deficit expanded to an estimated $782 billion in the first fiscal year of the Trump presidency, which is the widest fiscal gap since 2012 when the country was emerging from the Great Recession6 . The current deficit is equal to an estimated 3.9% of gross domestic product, up from 3.5% the prior year7 . Government revenues were about the same as the prior year while outlays grew about 3%, according to the Congressional Budget Office. The budget deficit has continued to climb in recent years, raising concerns that the country’s debt load, over $21.5 trillion at the end of September, is growing out of control8 . In October, the Treasury reported that the government paid $523 billion in interest in fiscal year 2018, the highest on record9 . As stock markets tumbled across the globe in mid-October, investors worried, for the second time this year, about slowing growth and the effects of tighter U.S. monetary policy. One of the fears in the aftermath of the Global Financial Crisis was that very low, or negative, interest rates and the poorly understood “printing of money” implied by Quantitative Easing (QE) would lead to runaway inflation. That didn’t happen. Rather, deflation became a greater threat and central banks’ extreme actions represented an attempt to minimize that risk. Conditions of excess supply meant that inflation remained subdued for much longer than expected. But as demand has recovered, inflation is now making a comeback although primarily on the wage front and so far to a lesser degree in the pricing of goods and services. American workers have been coping with weak real wage growth for a long time. According to the July jobs report, published August 3, 2018, the economy added 224,000 jobs on average per month over the prior three months, an annualized rate of 2.7 million, up from a rate of 2.2 million added in 2017, before the December 2017 Republican tax cuts10 . This job growth is expected to reduce unemployment, despite the fact a growing population may add about 1.3 million people to the labor force by mid-2019 and a similar number of net new people who have been rejoining the labor force (about 200,000 a year) over the past five years. Rising wage pressure will eventually cause problems for Wall Street and the Fed. Wall Street would like to see the historically high profit margins that have recently provided support to valuations begin to compress, unless companies are able to pass on their cost increases to consumers. 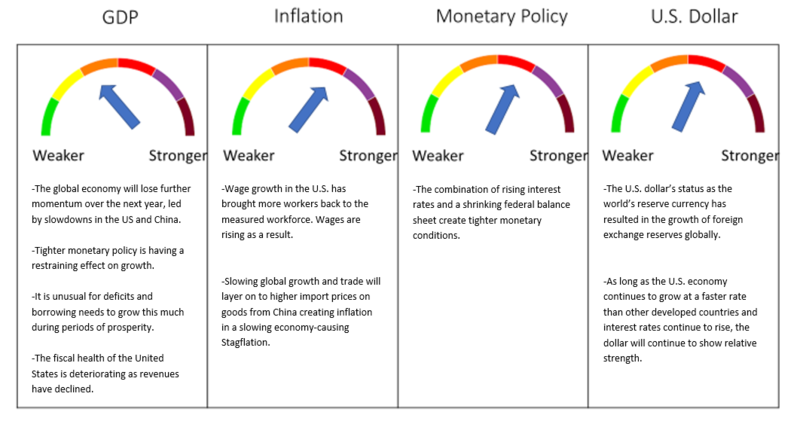 The Fed might have to choose between letting wages and inflation run a bit hot and risk rising inflation expectations or tightening monetary policy quicker and potentially causing a recession. China’s economy has shown signs of slowing in recent months. Growth in the third quarter was at the weakest pace since the financial crisis in 2009. For the last six years, President Xi has been gradually allowing more foreign competition in some sectors while centralizing control over others. Though slowing, the Chinese economy is still growing at more than twice the pace of the United States and is pouring money into advanced technology such as artificial intelligence, quantum computing, and biotech. The Trump administration imposed 25% tariffs on Chinese products beginning July 6, 2018. Almost all of the targeted products are intermediate inputs and capital equipment used by American companies to make final products and remain competitive in the global marketplace. The same products targeted by tariffs are available in other countries, such as Mexico, Japan, Canada, and Germany. U.S. companies are expected to evaluate product quality and prices across countries and decide whether it may be more advantageous to pay the Trump tariff and stick with the same Chinese product or buy a higher-quality input from an alternative source, impacting prices for consumers. SOURCE: THE ECONOMIST. FINANCE AND ECONOMICS SEPTEMBER 20, 2018. Time is most likely on the side of the Chinese. When China retaliated, announcing tariffs on up to $60 billion of American imports, it included a 25% tariff on soybeans to hurt farm states that had voted for Trump, such as Iowa11 . The fact that Iowa is both second among America’s soybean producers and disproportionately influential in American politics makes it a prime target. China wants a deal, but Trump believes he is leading a fight against globalism, by which he means any order that binds American sovereignty or fails to put American workers first. China has a very significant stake in the stock of U.S. Treasuries. The U.S. depends on foreigners, who hold and refinance their treasury positions, to finance their growing budget deficit. China’s share of U.S. Treasuries fell for a third consecutive month in August, which may be viewed as a response to the trade war, especially after China’s ambassador to the U.S. signaled in March that his country could scale back purchases of debt as retaliation. Chinese ownership of U.S. bonds, bills, and notes was $1.165 trillion in August, down from $1.171 trillion in July, according to data released by the U.S. Treasury Department. China may well have allowed its foreign-exchange reserves to decline as part of a policy to stabilize the yuan and prevent it from weakening further. The currency already has depreciated more than 4% against the dollar in the past year amid signs of an economic slowdown and capital outflows. While this has occurred, it is also noteworthy that Japan, which is the largest foreign owner after China, decreased its Treasury holdings in August to $1.03 trillion from $1.036 trillion in July while Saudi Arabia increased its ownership by $2.7 billion to a record $169.5 billion12 . The U.S. and China are more commercially linked than the U.S. and the Soviet Union. They share responsibilities including the environment and security interests, such as the Korean peninsula. When the U.S. competes with China as a guardian of a rules-based order, it starts from a position of strength, however, when the U.S. becomes a weaker moral and political force, it loses its primary advantage. Recognizing this from a U.S. negotiating perspective would aid the U.S. in trade gains with China. Equity volatility rose across the board during October, led by a sell-off in large U.S. technology and communications names, and possibly reinforced by signs of rising long-dated Treasury yields. It is more common for economic downturns preceded by market volatility to be caused by multiple factors rather than a single one. Over the last 45 recessions, monetary policy tightening contributed to 29 of them. 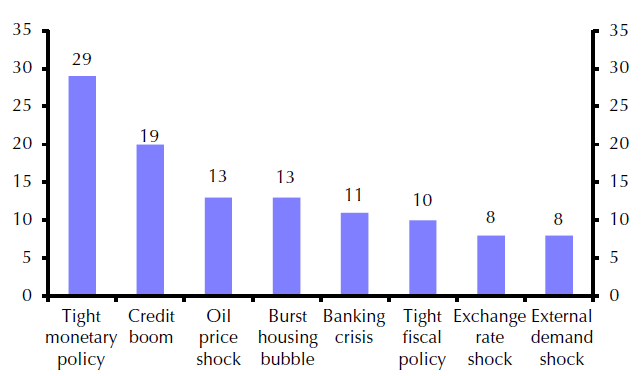 Other contributing factors include the bursting of credit bubbles, oil shocks, property collapses, tight fiscal policy, exchange rate shock, and external demand shock. SOURCE: CAPITAL ECONOMICS. GLOBAL ECONOMICS FOCUS. OCTOBER 26, 2018. The United States is further along in its economic cycle than other global economies and the appropriate level of tightening in policy rates will also continue to have a variety of knock-on effects to other economies across the world. We saw this happen in certain Emerging Markets countries this year, such as Argentina and Turkey, which have experienced extreme levels volatility in currency and rates. These pressures will likely underpin asset volatility in these markets, while trade war risks can potentially keep volatility elevated in some regions. During higher volatility, correlations have remained relatively low as defensive sectors and dividend-payers bucked the trends. With earnings season getting into full swing, lower correlations will likely continue as U.S. companies continue to benefit from the tax cuts earlier in the year. Volatility indicators increased globally along with the VIX, although none rose quite as much as the United States. In September, we increased our exposure to U.S. Equities across all models at 40%, 50%, 60% and 70% in the Tactical Conservative, Moderate Growth, Growth and Aggressive Growth respectively. This is consistent with our recognition that the tax cuts from earlier in the year are having a short-term positive impact on the economy that is more than offsetting the uncertainty created by the trade wars initiated by the U.S. on China as well as many other trading partners including Canada and Mexico. We added this net new exposure to Large Cap U.S. Equities with additional exposure coming from U.S. Small Cap. 1The Economist. The Next Recession. October 11, 2018. 2The Economist. The Next Recession. October 11, 2018. 3Capital Economics. Global Economic Outlook. Q4 2018. 4Capital Economics. Global Economic Outlook. Q4 2018. 5Capital Economics. United States Chart Book. October 18, 2018. 6Congressional Budget Office, October 5th, 2018. 7Congressional Budget Office, October 5th, 2018. 8TreasuryDirect.gov. Public Debt Reports. Debt to the Penny. 9TreasuryDirect.gov. Interest Reports. Interest Expense on Debt Outstanding. 10Bls.gov. The Employment Situation – July 2018. August 3, 2018. 11The Economist. America and China are in a proper trade war. September 20, 2018. 12Treasury.gov. Major Foreign Holders of Treasury Securities. In August, we maintained our outlook to reflect the impact of the escalating global trade wars. We are currently factoring in a six-month period of Stagnation followed by six months of Inflation. While the baseline forecast for the global economy continues for 2018 and 2019, the potential for disappointment remains. 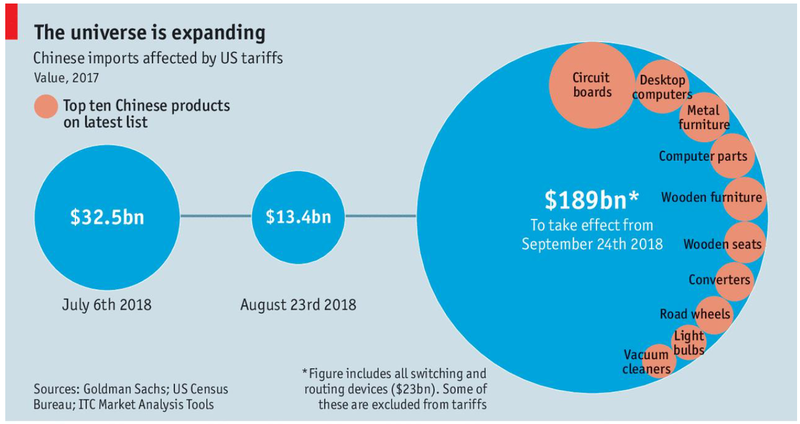 Tariffs generate what economists call a “deadweight loss,” with the impact on prices and consumption that results usually larger than the tariff revenue that is generated. In June, the U.S. government announced its intention to apply tariffs on an additional $200 billion of imports from China and threatened tariffs on imports of autos and parts in the future. This news follows earlier imposed tariffs on a variety of imports including solar panels, washing machines, steel and aluminum. Retaliation was swift, as the European Union, Canada, Mexico, and China imposed tariffs on imports from the United States. China is struggling to balance several challenges to its economic health with high levels of indebtedness. Euro area GDP growth fell short of expectations with a 0.3% increase in Q2, down slightly from the Q1 0.4% gain1. That leaves Euro area growth over the first half of the year at roughly half of 2017’s pace. A slowdown in France, the currency bloc’s second largest economy, was partly to blame. Euro area inflation rose above 2% for the first time since 2012, though core inflation remains well below the European Central Bank’s target. From the Central Bank’s policy path for the coming months, we expect net asset purchases trimmed to zero by the end of 2018 and rate hikes off the table at least through next summer. In the U.S., Q2’s advance GDP report came in at 4.1% annualized, one of the highest quarterly growth rates in the last decade1. The economy was performing very well, with domestic demand up almost 4%, led by a rebound in consumer spending and another solid increase in business investment. However, tariffs imposed by the U.S. on imports is expected to raise prices and lower real disposable incomes for consumers, jeopardizing the livelihoods of American workers. U.S. tariffs threaten consumer spending going forward since nearly 11 million jobs are supported by exports and millions of additional jobs directly depend on imports. Protectionism could also hurt corporate profits. The “rest-of-the-world” component has been driving U.S. profit growth the past few years, increasing its share of overall U.S. corporate profits to 20.3% in Q1 this year, a four-year high2. Continuing protectionism from Washington can potentially harm corporate America’s profitability, offsetting some of the benefits from tax cuts. The U.S. President initiated an investigation into imports of motor vehicles and parts from Canada on national security grounds – the same justification used for steel and aluminum tariffs. If the ultimate outcome of the investigation is the imposition of tariffs of a similar magnitude, the impact to Canada would be significant, potentially reducing growth in 2019 growth by 0.5%.3 Business investment would be the most significantly impacted, reducing Canada’s long-run economic capacity. Global financial markets reacted negatively to apparently souring trade relationships. The MSCI All-Country World index was down significantly after U.S. tariff announcements. In July, U.S. equities gained across all cap sizes. The S&P 500 gained 3.7%, while the S&P MidCap 400 gained 1.8% and the S&P SmallCap 600 gained 3.2%. Canada and Europe were also positive, with the S&P/TSX Composite up 1.1% and the S&P Europe 350 up 3.2%, with nearly all countries contributing positive returns. June’s focus on trade tensions and political risk largely gave way to positive earnings figures, economic data, and central bank guidance in Europe. Asian equities also enjoyed a positive month, though China and Korea contributed negatively to the region as lingering trade tensions continued to have an impact on markets. U.S. fixed income performance was mixed with high yield corporate bonds the strongest sector. In August, we shifted a portion of our fixed income exposure to U.S. equities in both the Growth and Aggressive Growth models, resulting in equity exposure shifting from 50% to 60% and from 53% to 65%, respectively. The shift was out of the existing U.S. municipal bond position and into U.S. mid-caps. 1 RBC Economics. Financial Markets Monthly. August 10, 2018. 2National Bank of Canada. Monthly Economic Monitor. Economics and Strategy. July/August 2018. 3 TD Economics. Potential U.S. Auto Tariffs: Canadian Scenario Analysis. June 18, 2018. Index return data from Bloomberg and S&P Dow Jones Indices Index Dashboard: U.S., Canada, Europe, Asia, Fixed Income. July 31, 2018. Index performance is based on total returns and expressed in the local currency of the index. European regional index returns are expressed in Euros.